The tried and trusted Noce Travertine French Patterned Tumbled tiles and pavers, have been a favourite for years, providing a warmth and depth with its slight caramel tones. Beautiful for outdoors including pool surrounds, alfresco areas, landscaping and pathways this timeless, classic look will outlive trends that come and go. Sareen Stone's range of Noce Travertine is extensive. 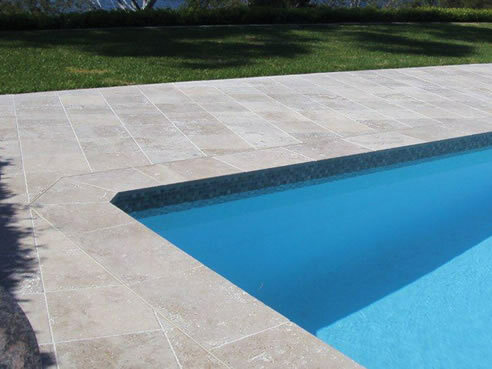 Noce Travertine tumbled is also available as a tile, paver, pool coping and step treads with pencil edge or bullnose profiles and can also be supplied as an integrated skimmer lid.